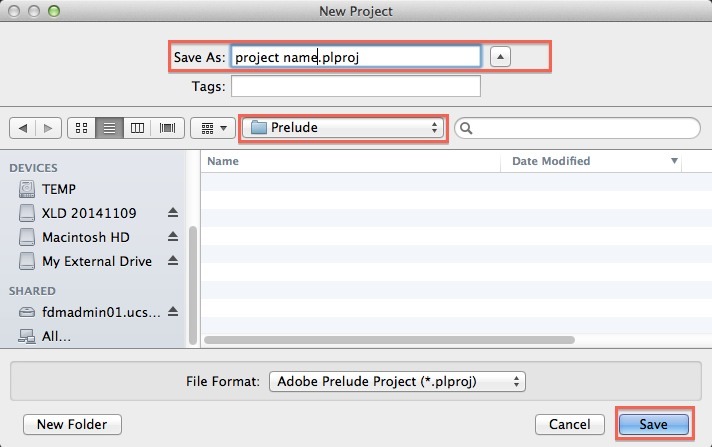 This tutorial explains how to use Adobe Prelude to convert (transcode) AVCHD/Camcorder footage into Apple ProRes format. After you have downloaded them, unzip the file by double-clicking on it. 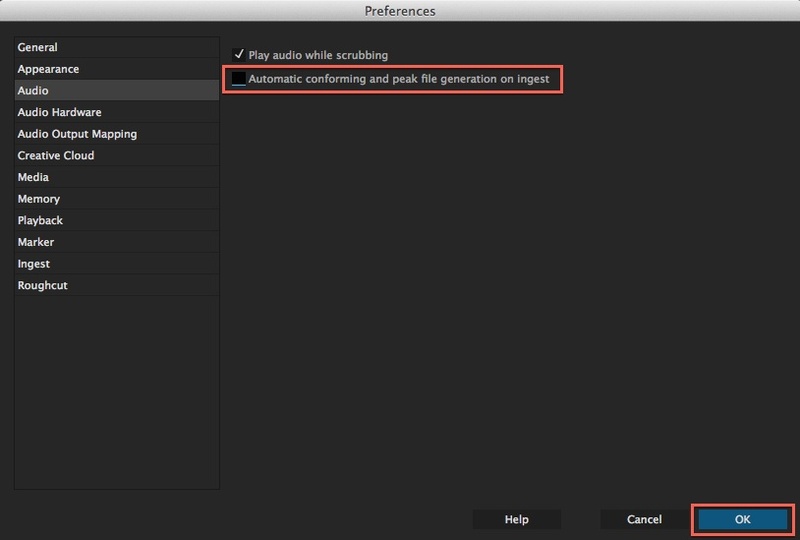 Next, open the Adobe Media Encoder application and choose Preset -> Import from the main menus at the top of the screen. 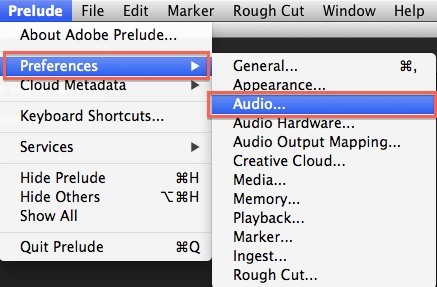 Browse to the presets you downloaded and click “Open”. This will install all of the codecs and allow you to follow this workflow at home. 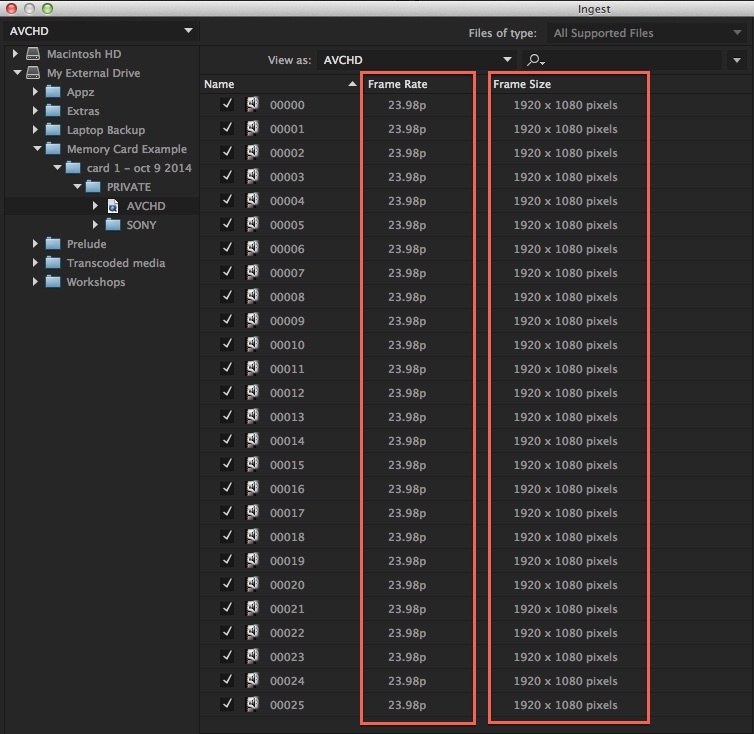 Before starting a new project, we suggest downloading our Default Premiere Folder Structure Template when starting a new Premiere Project. This can be used to serve as a template for you to insert media into on your hard drive prior to starting a new project which can greatly help you stay organized. 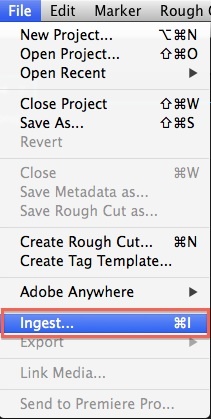 Step 1) Open Adobe Prelude by clicking the icon in the Dock. a) Check “Transfer Clips to Destination”. b) Under “Primary Destination” browse to a location on your hard drive where you want the transcoded .mov files to transfer to upon completion. c) If you would like a new folder made within the location you selected for your hard drive to store the .mov, check the “Add Subfolder” box and give it a practical name. e) Under Format: choose “Quicktime” ALWAYS. 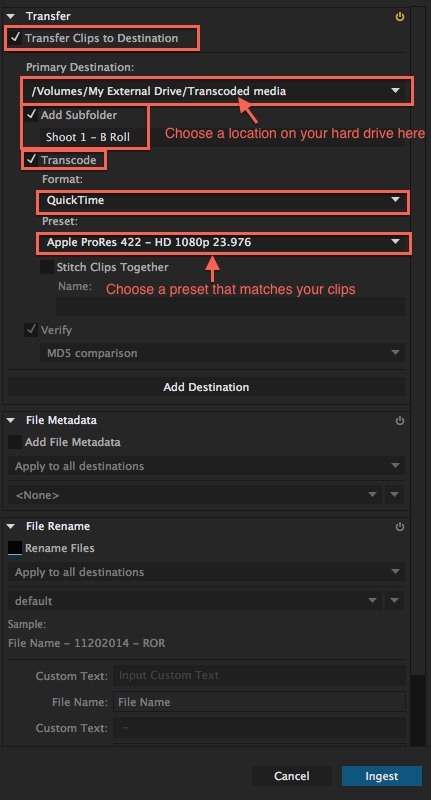 f) Very important: under Preset: Choose an Apple ProRes 422 – HD preset which matches the information displayed on your clips (as shown in step 8 of this tutorial). In this example I chose Apple ProRes 422 – HD 1080p 23.976 because my clips showed as 23.98p and 1920 x 1080p in the metadata display. g) Checking Add File Metadata and Rename Files is optional. 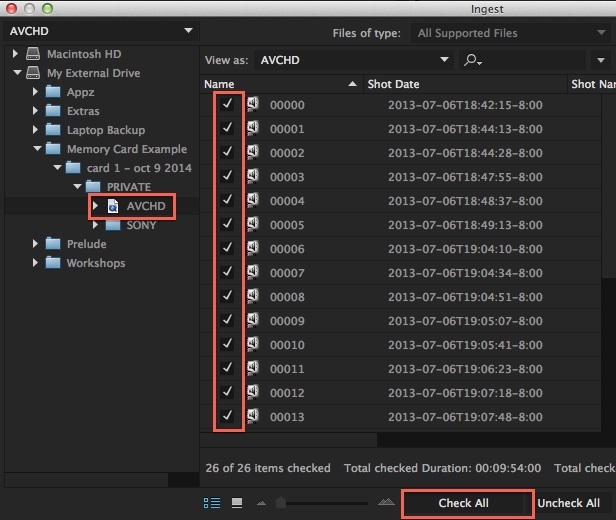 For beginners of the application, I recommend leaving these unchecked and using the Finder or Premiere itself to rename media after transcoding. Step 10) Click on “Ingest”. 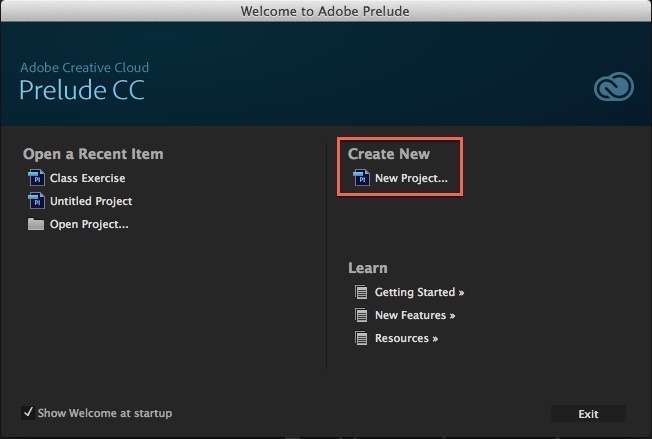 This will automatically open the application Adobe Media Encoder, and transcode your files. This can take a long time so be sure to budget your time accordingly. 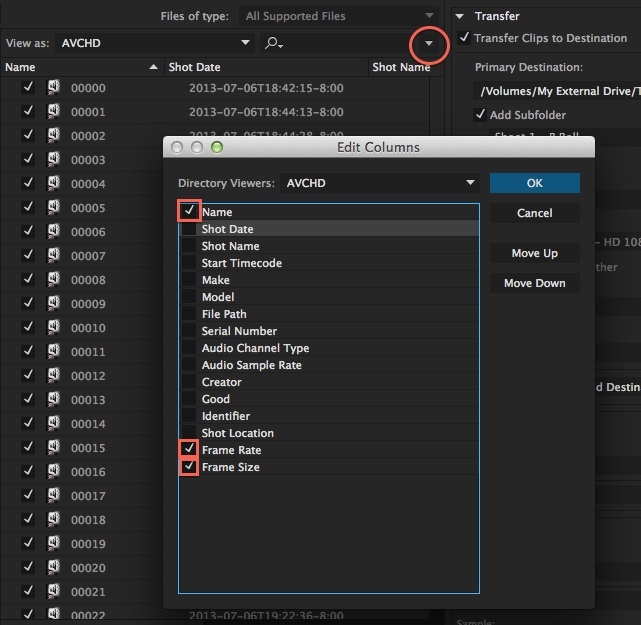 Once the items are finished transcoding in Adobe Media Encoder, you can quit Prelude and import the files into your editing software platform of choice.